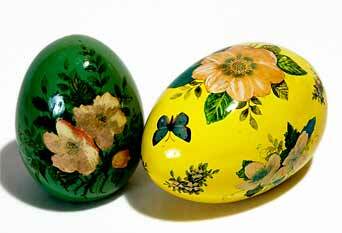 Joan de Bethel decorated eggs - 3⅞" (98 mm) high, 4¾" (120 mm) long. 1967. These eggs are very rare items made for a retailer in Brighton and like Joan's cats and bears from the same period, are made from papier maché.